1 of 7 Adjust a shelf in your oven to one of the lower positions. 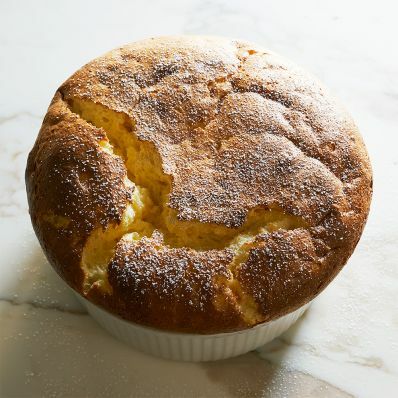 Heat oven to 350 F.
2 of 7 Lightly coat a 6-cup souffle dish with nonstick cooking spray. Add a tablespoon or so of sugar to the dish, shaking to coat sides and bottom evenly; tap out excess. 3 of 7 Place egg whites, cream of tartar and salt in a medium-size bowl. 4 of 7 Zest 2 teaspoons of the peel from the tangerines. Juice all of the fruit for 3/4 cup. 5 of 7 In a small saucepan, melt butter over medium-high heat. Whisk in flour, then gradually whisk in juice and bring to a boil. Boil 3 minutes; remove from heat. Beat egg yolks in a large bowl until light in color, about 3 minutes. Beat in1/2 cup of the sugar until fluffy, about 2 minutes. Whisk in tangerine zest and a spoonful of the thickened juice. Stir in remaining thickened juice from saucepan. 6 of 7 With clean beaters, beat whites until foamy. Beat in remaining 1/4 cup sugar until medium-stiff peaks form. Fold half of the whites into the yolk mixture just until combined, then fold in remaining whites. Scrape into prepared dish. 7 of 7 Bake at 350 F for about 40 minutes, or until souffle is puffed and browned (do not open oven door). Dust top with confectioners sugar and serve.